This week’s quote is beautifully put by French poet, playwright, novelist, essayist, visual artist, statesman, and human rights campaigner, Victor Hugo. I particularly love the nod to “…that which cannot remain silent.” Music represents a mechanism for us to express things that we not only want to say, but also that we NEED to say. This has rung true for many generations. The ideas expressed through music have spawned actions, movements and change throughout history simply by putting to words what the general public cannot. For those of you who are fans of purely instrumental music, this quote can be thought of in a bit of a different light. How many times have you been uplifted by purely instrumental music? I have, on multiple occasions, been unable to explain how a song makes me feel… I just know that all is well when I hear it! 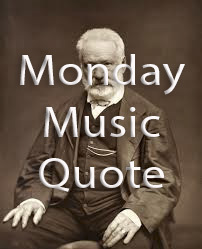 This entry was posted in Monday Music Quotes and tagged Monday, Monday Music Quote, Music, Quote, Victor Hugo.